When it comes to purchasing a vacuum cleaner for aircraft use where turnaround and reliability mean everything, there is a lot to consider. Anderson Trade, nationwide supplier of commercial cleaning machines, offers help choosing the right machine. DERBY, England - Sept. 5, 2018 - PRLog -- What's important when buying a vacuum cleaner specifically for aircraft use? It's a good question, especially in situations where turnaround and reliability mean everything. Respected nationwide supplier of commercial cleaning machines, Anderson Trade, is looking at the key things to consider when making such a purchase. Firstly says Anderson Trade, it is important that your aircraft vac keeps on going to get the job done in your short timeframe. "If you're going for a battery operated model, always check the runtime of the battery. You should be looking for something in the vicinity of 40 minutes," says their spokesperson. "Some models will store two batteries so you have a back-up, crucial if you are hopping from one aircraft to another in a short time span. Also check out the charge time. Too long and it could cost you in turnaround when it matters most." Anderson Trade cites the I-Vac Battery Operated Vacuum Cleaner as a good model for aircraft use. It has a smart charger that shows the voltage and a time clock, making it easier to see the time remaining until full charge. "If you don't want to rely on battery charge, go for a model that runs on the aircraft's power supply instead," says Anderson Trade. "But make sure the machine is designed specifically for the aircraft current: a regular vacuum won't do." The weight and size of an aircraft vacuum cleaner are also key considerations. Anderson Trade asks, "Can you easily lift the machine up the stairs and onto the aircraft? Does it manoeuvre well through the aisles, under seats and into small spaces? Consider this when you are making your choice. If you hone your search specifically to aircraft spec machines, you should tick all these boxes." Anderson Trade's spokesperson also suggests thinking about the toolkit supplied with the cleaning machine. "What does the aircraft vacuum cleaner come with? The toolkit supplied could make all the difference. For example, the Numatic ANV180s Aircraft Vacuum Cleaner comes with an orange, hi-vis anti-kink cable; a full aluminium kit; a large Tritex filter and five HepaFlo bags. Always check precisely what you are getting when you buy your aircraft vacuum cleaner." Health and safety is another important consideration says Anderson Trade. "Think about your operatives and how handling a vacuum cleaner within limited spaces and up and down staircases could affect them. You may wish to consider a backpack style cleaner. 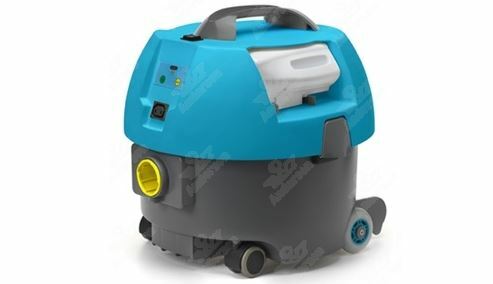 "The Pacvac Superpro 700 is a battery operated, backpack style vacuum cleaner that is ergonomically designed for the ultimate in comfort and safety in use. There's no lifting of heavy or cumbersome machines and a smooth and effortless clean is guaranteed every time. "The Numatic Rsav200 Aircraft Spec is another ergonomically designed backpack style machine featuring a comfortable harness that provides the operator with good mobility into awkward to reach locations." Lastly, think about whether you need a machine that can also tackle stains and spillages. For the ultimate in flexibility, consider a wet and dry model. "The Numatic Awv380 Aircraft Spec Wet Vac uses the aircraft's power supply. It acts as both a regular dry aircraft vac, and doubles as a wet vac for dealing with spillages and stains." Anderson Trade is a UK-wide stockist of a range of aircraft spec vacuum cleaners. They offer a free, personalised onsite demonstration, allowing professional cleaners to ensure they select the ideal model to suit their individual needs. What's more, Anderson Trade stocks an extensive range of parts and spares for all leading brands of commercial and aircraft spec vacuum cleaners. To learn more, visit https://www.anderson-trade.co.uk/vacuum-cleaners/aircraft-vacs or call 01332 347 557 for individually tailored advice.